The first part of creating a living room that provides everything you need is to make sure you can sit comfortably, then stand up with ease. Balance issues, recovering from injuries, or loss of strength can make this simple task a huge hurdle. A few items and some pre-planning can help overcome them to give you a place to relax. 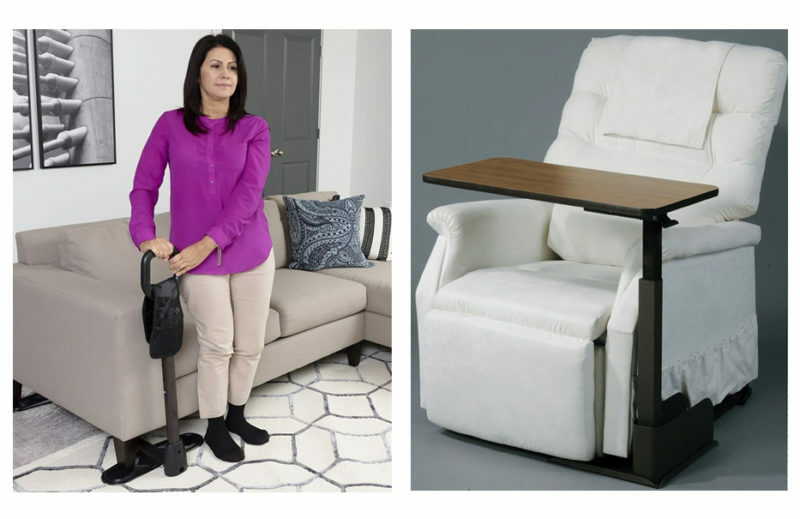 For those who would like to use their own living room seating, seating assistance comes in two categories. 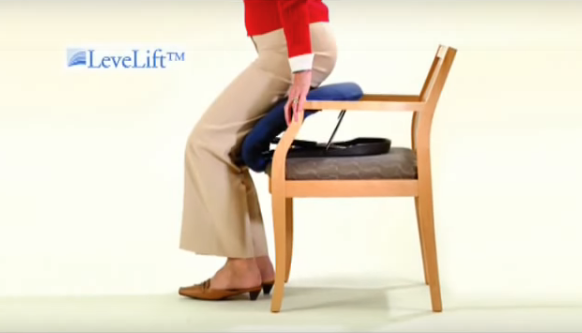 First, you can use a lift, which rests under you on your chair. The other option is a pole or handle next to your chair for assistance in rising. You can also use the two in concert to make sitting and standing easy. 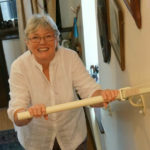 A couch cane standing handle installs on either side of your couch or next to your favorite chair. 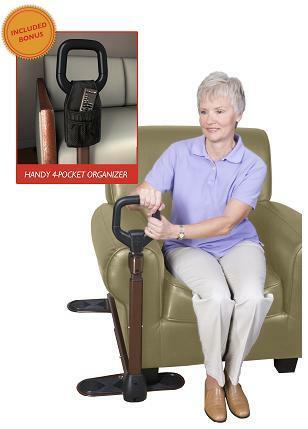 Held in place by the feet of the couch itself, this assist device will support your weight as you rise, with room on the generous-sized handle for both hands if needed. 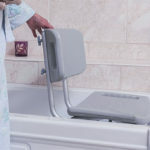 If you want to have handles at various heights to assist you as you rise, then a floor to ceiling grab bar is ideal. These have four or more hand positions so you can shift and adjust as you rise. Installed without tools, they use tension mounting and fit ceilings from 7 to 10 feet in height. 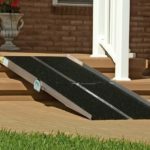 If you don’t need an electric self-powered lift, then the Upeasy seat assist may be your best option. It supports up to 70% of your body weight as you rise, allowing you to maintain balance. The Upeasy power seat electric lift by Carex is an electric-powered lifting seat that fits almost any armchair or sofa. 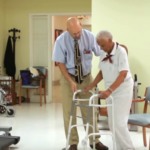 Even if your balance or strength are not what they were, you can still keep your independence of movement. Full tilt lift chair recliners provide a more comfortable overall experience because they eliminate the need for something between you and the seat. You still get the assist in standing, but with a tilt recliner the whole chair rises to help you when it’s time to get up. You can even add options like in-seat heating for those who are chronically chilly or massage. 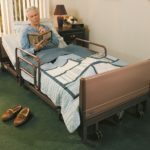 Three-position recliners are specifically designed for those who are unable to move easily on their own yet want to stay involved in the daily activities of the house. 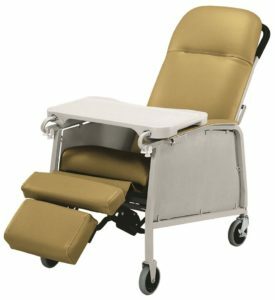 They offer the ability to change from upright to partially reclined for reading or TV watching, to fully reclined for rest as needed. As a result of shifting positions, the patient benefits from increased circulation and remains more comfortable for longer periods of time. Our living area is where most of life happens. In order to enjoy it, we need to not only be comfortable, but also have those things we use regularly within easy reach. Nothing is more frustrating than getting settled in to read a good book, watch the next episode in our favorite show, or get ready to call the kids only to find you are missing your glasses, the remote or the phone. Here are some things to help you stay comfortable and organized in your living area. Binge watching or reading and sitting in one position too long can result in a bruised tailbone or pressure sores. These make relaxing in your living room no fun at all. To combat sore spots from sitting too long before they occur, a foam chair cushion is a great item to have. Simply place it on the seat before you sit down, and rest comfortably for hours. Nightstand organizers work well in the living room too. 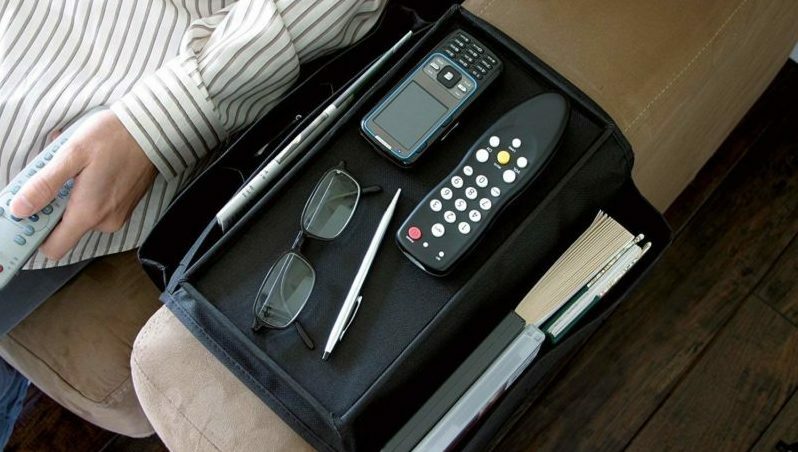 Many have a charging port for your phone or tablet along with plenty of designated spots for things like glasses and pens. An armrest caddy can be as simple as a couple of pockets in cloth material draped over the arm of your couch, or it can be an intricate multiple-compartment plastic contraption. There are wooden and wicker options, and even those that come with a writing surface. If you have a cane stander, this even comes with an organizer pouch that straps onto the handle for easy access to your items. A surface for writing, reading, or placing your laptop is a great idea. Unfortunately, having a table in front of your sitting ear can make it difficult to get up and down. A rolling table answers all these issues. Move it out of the way to sit or stand up, and pull it into place once you are settled. 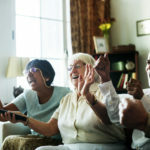 Keeping your living area secure is another aspect of independent living. It only takes a few small steps to prepare for the best outcome. 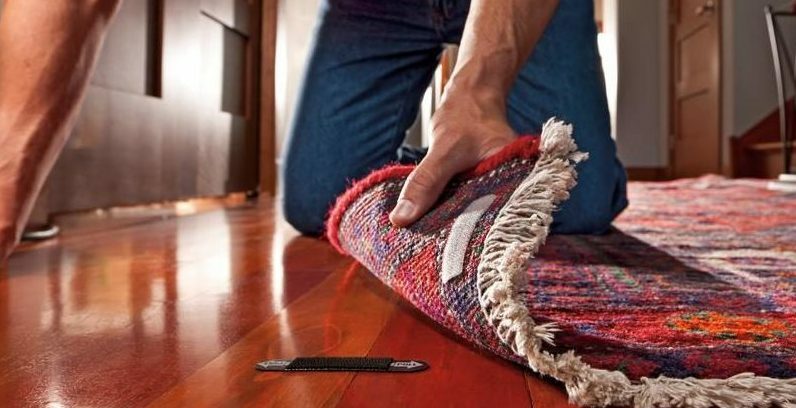 Make sure all your carpets are flat and securely attached to the floor. A very small uneven lip can create a trip hazard. Tape down edges, rug anchors from floor to carpet, and remove those that curl at the edges. Install lighting along hallways to and from the living area. While turning on the overhead light may be an option, it’s better to have an always-on set of lights. 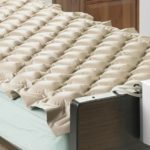 Install these at ankle height at intervals so even if you get up in the middle of the night, you will be able to see to walk around your home. 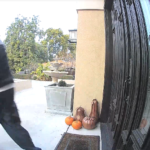 Install a security camera at the front door. You don’t want to feel the need to jump up and dash to the door if it’s not someone who you feel comfortable answering. 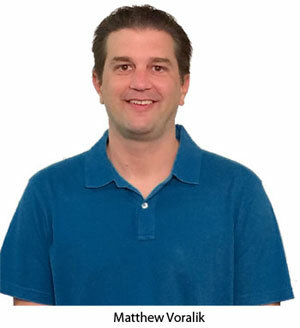 Many cameras now link to your tablet or phone so you can see who it is before getting up. 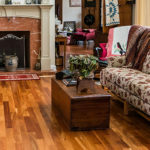 With a little bit of forethought and some simple fixes, you can add security and comfort to your everyday living, making your living room a place to enjoy relaxing in.